Oops, it's been a busy few weeks! On the May Bank Holiday weekend this year (3rd-6th May), we're hosting the first ever Ballymaloe Literary Festival of Food and Wine at the Grain Store, Ballymaloe House and Ballymaloe Cookery School. 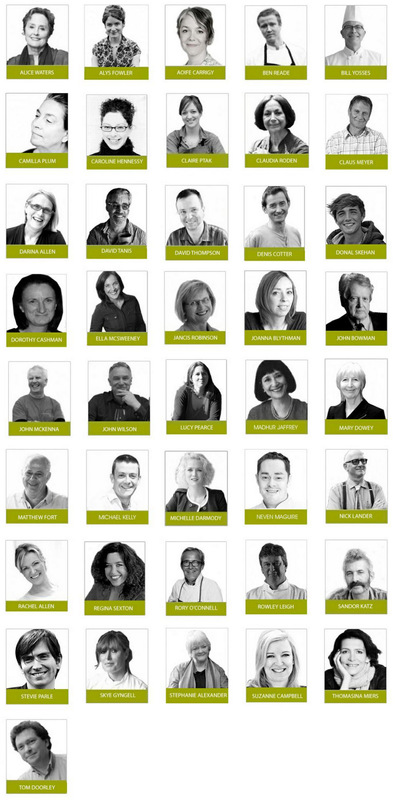 We have an incredible line-up of over 40 speakers including: Alice Waters, Madhur Jaffery, Claudia Roden, Stephanie Alexander, Claus Meyer, Camilla Plum, Rowley Leigh, David Thompson... Jancis Robinson MW and her husband Nick Lander are coming over from the UK, as are Joanna Blythman and some of the new young voices in food: Thomasina Miers, Stevie Parle, Alys Fowler and Claire Ptak... And that's just the beginning. This glittering international cast will be matched by a strong Irish presence. You'll have to look at the Litfest.ie website to get the whole picture. And we even keep adding to that! How about this for a tempting line-up? When we first came up with the idea, I was tremendously excited, as I still am, at the thought of bringing leading figures from the world of gastronomy to East Cork, for all of us to meet and mingle with. So I just picked up the phone and spontaneously rang many of my friends in the food and wine world, as one name after another flashed into my mind. I asked if they'd like to come to Ballymaloe, and they all, apart from one or two who were already committed, said yes. After a few days I thought I'd better count and see where I was, and by that time almost thirty people had agreed to come, so then I thought it was time to stop and to consider the practical implications of flights and so on! The idea had first come about when a friend of ours Geoffrey Dobbs, who is a founder member of the Galle Literary Festival in Sri Lanka, came over to Ballymaloe and suggested we had a literary festival at the Grain Store, which he felt was made for this sort of event. For us here, the obvious connection was food and wine, and when we started to check around we discovered that whilst there were numerous literary festivals, ditto food festivals and wine festivals and tastings, for some reason there didn't seem to be a literary festival of food and wine. Organising this sort of event is new territory for all of us and an exciting learning curve. We have been buoyed up by people's reaction and the enthusiasm and support of our sponsors, to whom we are so deeply grateful, there's a list of them on our website. We've already had lots of offers of help in many different areas and enthusiastic volunteers for over the weekend. We are also planning a huge FRINGE in The Big Shed with a myriad of events for all the family - do go and check it out on the website. I think it's really important to involve all ages. And we've also linked up with local schools. We have oraganised a "literary competition" to encourage budding young authors to think about food, and to write a story about a local farmer, fisherman, food producer, cheese maker... that they know and admire. The bookings are coming in thick and fast, a few events are already booked up, but there are still tickets available for many sessions. Tell your friends, spread the word, and I really look forward to meeting you there.